Squamata (scaled reptiles) is the most diverse order of extant reptiles, comprised of the lizards and snakes and characterized a flexible jaw structure (movable quadrate bones) and having scales or shields rather than shells or secondary palates. Of the four surviving orders—the others being Crocodilia, Rhynchocephalia, and Testudines—the squamates represent more than 95 percent of the known living species (Uetz 2000). Despite their diverse forms—such as the lack of legs in snakes, presence of legs in lizards, and resemblance of the amphisbaenians to worms—squamates share many of the same traits. Some of these characters are not shared with any other reptiles, and in the case of paired penes, with any other vertebrates. This reflects that all squamates belong to the same lineage, as descendants of a common ancestor. Reptiles are tetrapods (four-legged vertebrates) and amniotes (animals whose embryos are surrounded by an amniotic membrane that encases it in amniotic fluid). Reptiles have traditionally been defined as including all the amniotes except birds and mammals. According to Uetz (2000), there are a total of 7,870 extant species of reptiles, with the majority being lizards (4,470 species) and snakes (2,920), and with 156 amphisbaenias, 23 described species of living crocodiles, 295 species of turtles, and 2 species of tuataras. Similarly, Grzimet et al. (2004) note 1,440 genera and 4,450 species of lizards and 440 genera and 2,750 species of snakes. In all, this means that almost 96 percent of living reptiles belong to the Squamata order. Squamata is considered to be a natural monophyletic group, with all squamates being descendants of a common ancestor (Grzimek et al. 2004). They have more than 70 shared derived traits (Grzimek et al. 2004). 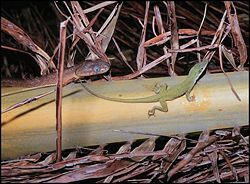 The lizards (suborder Lacertilia or Sauria) by themselves are considered to form a paraphyletic group. Members of the Squamata order particularly are known to all possess movable quadrate bones, making it possible to move the upper jaw relative to the braincase. This is particularly visible in snakes, which are able to open their mouths very widely to accommodate comparatively large prey. Other shared traits include having only a single temporal opening or it is lost or reduced, a highly modified skull, and with the male members of the group Squamata being the only vertebrates with a hemipenis (possessing paired penes). They also are distinguished by their skins, which bear horny scales or shields, while lacking any shells or secondary palates. This is also the only reptile group in which can be found both viviparous and ovoviviparous species, as well as the usual oviparous reptiles. Benton (2000) considers Amphisbaenia to be an infraorder within the Squamata Order, while considering the lizards (Lacertilia or Sauria) and snakes (Serpentes or Ophidia) to be orders. Uetz (2007) considers Amphisbaenia to be an suborder as with the lizards and snakes. In this newer classification, Iguania is now believed to represent a separate lineage from the others, which are placed in the suborder Schleroglossa. The exact relationships within these two suborders are not entirely certain yet, though recent research strongly suggests that several families form a venom clade which encompasses a majority (nearly 60 percent) of Squamate species. The Squamata do not include the tuataras, New Zealand reptiles resembling lizards. Benton, M. J. 2004. Vertebrate Paleontology, 3rd ed. Blackwell Science. ISBN 0632056371. Evans, S. E., and L. J. Barbadillo. 1998: An unusual lizard (Reptilia: Squamata) from the Early Cretaceous of Las Hoyas, Spain. Zoological Journal of the Linnean Society. 124: 235-265. Kazlev, M. A. 2007. Squamata: Overview. Palaeos.com. Retrieved November 30, 2007. Myers, P., R. Espinosa, C. S. Parr, T. Jones, G. S. Hammond, and T. A. Dewey. 2006. Order Squamata (amphisbaenians, lizards, and snakes). Animal Diversity Web (online). Retrieved November 30, 2007. Uetz, P. 2000. How many reptile species? Herpetological Review 31(1):13–15. Uetz, P. 2007. Order Squamata. Reptile-database.org. Retrieved November 30, 2007. This page was last modified on 2 April 2008, at 16:55.